Greg Marks, the alleged owner of Greg Insider Method promises you a 100% win-rate binary trading software. Can he be trusted? More importantly, is Greg Insider Method a scam? Let’s find out in our Greg Insider Method review. 100% win rate and endorsed by BBB? What a load of nonsense! 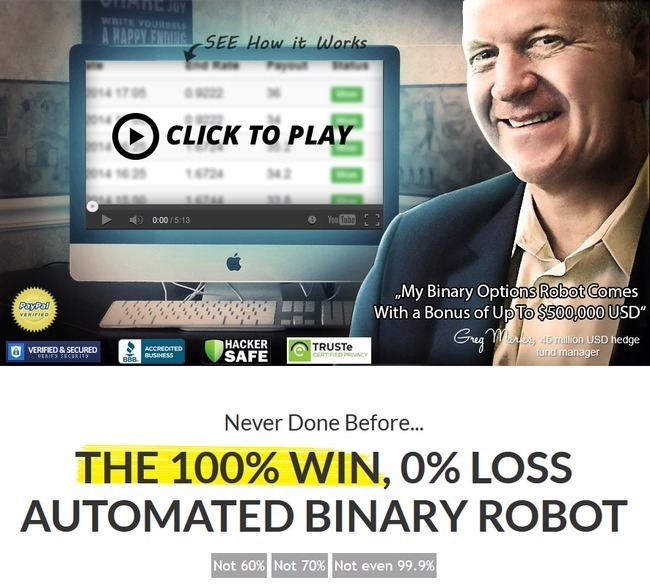 Greg Insider Method scam (yes, it is a scam) by Greg Marks promises you a 100% win rate with his binary trading software. He claims that his software is “nothing like the other automated robots out there”, and you will not suffer even a single loss with Greg Insider Method. In the sales video, Greg Marks claims that he is a renowned hedge fund manager who handles 45 million USD account routinely. If you try to search for his name, you’ll realize that there’s no such person in this industry. Greg Marks is just a fake character used to provide some non-existent credibility to Greg Insider Method scam. Also, Greg Insider Method is not endorsed by Better Business Bureau (BBB), despite displaying the logo in their homepage at greginsidermethod.com. A thorough search in BBB proves that neither Greg Marks nor Greg Insider Method is registered with BBB. Greg Insider Method is just one of many binary trading software scams. Read on for more details of the other red flags you should be aware of. Before we continue with the review, we want to explain how binary trading works to make sure everyone is on the same page. If you have experience trading binary options, you may skip this segment. Binary options is gaining popularity in the recent years due to its simplicity. You don’t have to stay on top of financial news and analyze sophisticated charts like what you do with stock markets and Forex. With binary options, you only guess if the price of an asset will rise or fall after a short period of time, usually between 30 seconds to minutes. You either win, or you lose (hence the name binary options, or 2 options). This is how it works – let’s say I predict that the exchange rate of GBPUSD will rise after 5 minutes, and I bet $50 on a 5-minute contract. If I’m right, I’ll win a certain percentage of what I bet, usually between 60% to 80% ($30 to $40). But if I’m wrong, I lose the entire $50 that I bet. You should realize by now that trading binary options is not that different from the average gambling. There’s no good way to predict market movement in such a short period of time. How do you predict the outcome of a coin toss? You simply rely on pure luck or gut feelings. It’s no different when it comes to trading binary options. Even if you manage a 50% win rate, you’ll still lose money given the uneven winning vs losing payout. How Does Greg Insider Method Work? 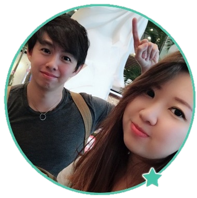 Greg did not explain how his binary trading bot is different from any other scams, but he emphasizes that his system can offer up to $500,000 “insurance” and you won’t have to suffer a single losing trade. Now, the $500,000 is not actually insurance, but a matching trading bonus offered by its affiliated broker. Anyone who has done some research will know that there is no insurance when it comes to binary trading. After you open an account with Greg’s affiliated broker, an account manager will call you up and ask if you want to top up your trading account. The broker will match the amount of your deposit. For example, if I top up $1,000, the broker will deposit an additional $1,000 into my account. Sounds like an unbeatable deal? Not really. Once you accept the offer, your funds will be locked inside the account until you have performed a certain volume of trades. Most often the volume is very hard to attain, and by the time you attain it, you would’ve lost most of your capital. Your only choice to reach the volume required is to trade by yourself, or activate Greg Insider Method software and let it trade for you. Either way, you are going to suffer a major loss, if not all of your trading funds. Inside the sales page of Greg Insider Method, you’ll see this ironclad trader guarantee of up to $500,000. If you lose even a penny, you’ll get a refund from Greg. Sounds too good to be true? Indeed it is. Greg Insider Method is actually the now-defunct Legal Insider Bot scam! Firstly, if you take a close look at Greg Insider Method’s disclaimer, you’ll realize that it is actually a re-brand of Legal Insider Bot scam which is no longer functioning now. The scam was infamous in year 2014 and had received scam complaints by many users. Greg Insider Method is really just a re-branded Legal Insider Bot scam. They didn’t even bother to change the content in their disclaimer. Secondly, despite giving you a guarantee of up to $500,000, The disclaimer of Greg Insider Method says otherwise. Read closely: “failure to adhere to the aforesaid guarantees are the sole liability of the herein mentioned third-party companies”, which the third-party company being their affiliated broker, TitanTrade. What does it mean? It means that if you lose money, you cannot hold Greg Insider Method accountable. 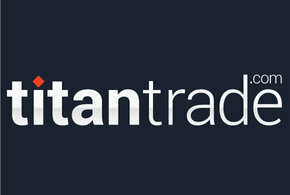 Instead, you should seek your refunds from TitanTrade, the third party broker used by Greg Insider Method. How can you seek damages from TitanTrade when the guarantees were given by Greg Insider Method? You will never get your refunds. Greg has some secrets hidden the disclaimer! If you are still not convinced, here are some more hard proofs. Remember the 100% win-rate that Greg Marks keeps talking about? I’m sure you do. Now let’s look at what Greg has to say in his disclaimer, shall we? What can we conclude from these terms? Despite guaranteeing you 100% win-rate in the sales materials, Greg Insider Method scam is going back on their words using their disclaimer. No actual guarantee is to be made, and you must accept the risks of losing money in order to invest in the options markets. The most shocking truth is – no actual trades have been made with Greg Insider Method! All the earnings and promises are just fake numbers used to attract your attention. If you think these terms are included as a fair warning for you, you are wrong. The only purpose these terms are included is to protect them from legal actions when you lose all your money. You cannot do anything to them. If they wanted to be upfront, they would’ve warned you about the risks of trading binary options and that there were no actual trades made with Greg Insider Method software. You may wonder why Greg Marks makes so much effort to promote Greg Insider Method only to give it away for free. If you decide to use Greg Insider Method, you’ll be required to sign up with TitanTrade for a new trading account through their affiliate link. 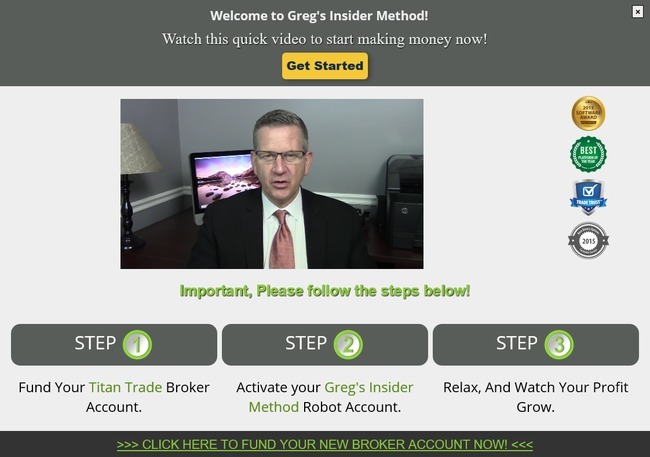 Greg Insider Method will earn a sum of referral fees as soon as you makes your first deposit. Not only that, Greg Insider Method will continue to earn commissions off you over the long period of time. They get a cut of commission for every trade that you make. Regardless of whether you win or lose money, Greg Insider Method will profit from you as long as you are still trading from your account. Is Greg Insider Method a Scam?